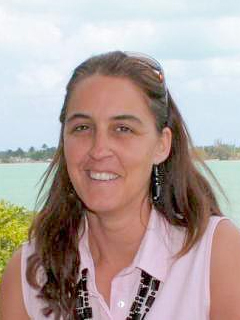 Maria Josefina Olascoaga is an Associate Professor in the Department of Ocean Sciences at the Rosenstiel School. Her research focuses on the study of transport and mixing in the ocean. She has contributed to make the modern dynamical systems concept of Lagrangian Coherent Structures widely recognized by the international oceanographic community through her publications and meeting presentations, and the organization of scientific meetings and workshops. Olascoaga teaches undergraduate and graduate courses on Physical Oceanography, Introduction to Marine Science, Modeling of Physical-Biological Interactions, and Lagrangian Fluid Dynamics and Predictability. She advises graduate students in the Ocean Sciences program. Olascoaga grew up in Buenos Aires, Argentina, where she received her Licentiate in Oceanography from Instituto Tecnologico de Buenos Aires (ITBA). That year she moved to Ensenada, Baja California, Mexico to pursue graduate education. She obtained her ScD from Centro de Investigacion Cientifica y de Educacion Superior (CICESE) under the advisement of the late Professor Pedro Ripa. She then moved to Miami to pursue postdoctoral training. Olascoaga joined the faculty at the Rosenstiel School in 2008, where her research has focused on the study of transport and mixing of biogeochemical tracers in the ocean. Olascoaga is recipient of the 2001 Best Thesis Award in Earth Sciences from the Mexican Geophysical Union (UGM). She has published over 30 peer-reviewed scientific publications and her work has been highlighted by Eos and featured on the BBC. Olascoaga is regularly invited to make presentations at meetings and workshops. She also has been organizer of several scientific meetings and workshops. She has been PI and co-PI of a number of national and international research projects. Olascoaga employs modern tools from nonlinear dynamical systems theory to study transport and mixing in the ocean. Such tools have led to the development of the concept of Lagrangian Coherent Structures (LCS). The LCS forms the building blocks of the hidden skeleton that shapes global transport and mixing patterns. A recent practical example of the utility of the LCS tool is its ability to forecast oil slick instabilities from the Deepwater Horizon spill in the Gulf of Mexico. Olascoaga was the Applied Marine Physics program director. She is regularly involved in K-12 outreach activities. Olascoaga also is a member of the MPOWIR program, whose goal is to promote the retention of women and minorities in oceanography.